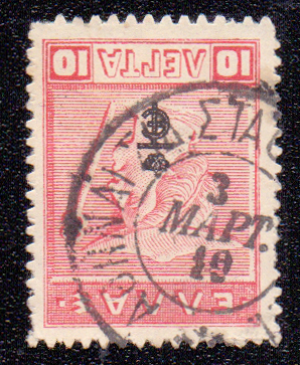 10 l lithographic overprinted E/T stamp canc. Athens Railway Station pmk. "ΑΘΗΝΑΙ ΣΙΔ. ΣΤΑΘΜΟΣ Π.Α.Π. * 3 ΜΑΡΤ. 19" Scarce. We ship by registered mail.We combine shipping (the final rate depends on the weight). Τέλος αντικαταβολής για Ελλάδα 4€. We can ship by regular mail at your own risk. Greece, Athens, 1919, 10 l lithographic overprinted E/T stamp canc. Athens Railway Station pmk.